You are viewing the Embroidered Jacket bundles. These products have been carefully selected from our full range of jackets because of their popularity, quality, price and differing functionalities. All jacket bundles feature garments from the following brands. B&C Collection : Continental designers of functional fashionable promotional wear. The sirocco jacket is a wind breaking, water resistant outer layer, designed to protect the wearer from damp and chill. It also folds away making them practical and easy to distribute. Check out how many different colour options there are too! 1 of the vibrant colours will surely match your branding. Regatta : One of Europe's largest outdoor performance clothing companies. 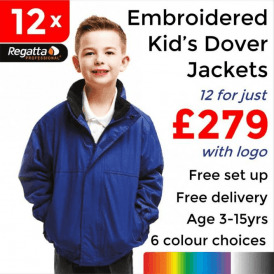 Regatta jackets are great quality, the ones we have chosen have a particularly good fit. On top of that stock availability is great menaing your orders will be dispatched in time for when you need it most! The Softshell jackets are even more versatile, you will notice many Blue chip companies adapting their uniform to include these advance garments, take a look and see what we mean. 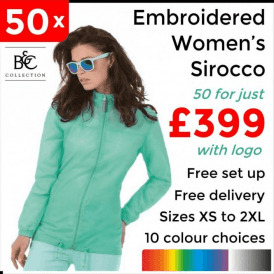 Uneek : These Classic softshell jackets feature all of the advances you would expect from such a jacket, protection from wind and rain but being breathable at the same time. All this whilst maintaining a true entry level price, we have made this even more appealing with the men and women's bundles including your embroidery. 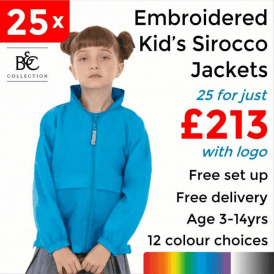 All Jacket bundles include embroidery to the left breast using the embroidery access of the garment. In all instances you will receive a visual by email showing your logo on the item so you can approve or amend your design before we go ahead. I want more than 1 embroidered design on each item! Filters on the left side of your page make browsing the Jacket bundles really quick and easy. Sirocco jackets come in bundle breaks 25, 50, 100 & 250. Softshell and Dover jackets come in quantities 12, 25, 50 & 100. Jacket bundles include Unisex, Women's & Children's specific items.